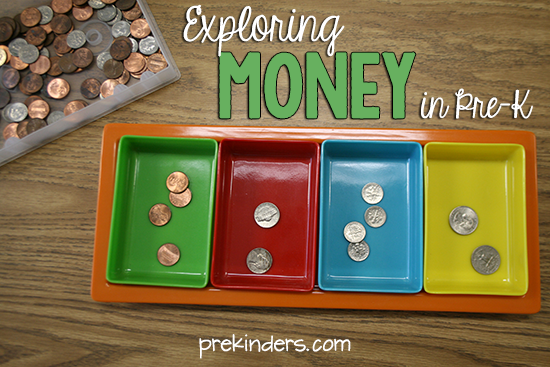 Money concepts are difficult for young children, but the purpose of these activities are to expose children to money and it’s purpose in fun ways. I do not teach them to count money in Pre-K (except, we sometimes count pennies just like we would count any other manipulative). 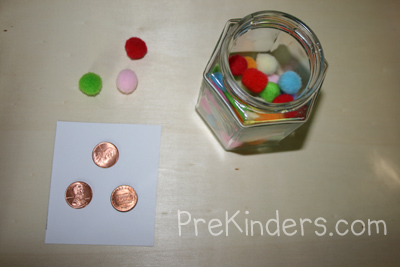 These activities can also be used to make literature connections with picture books, such as Benny’s Pennies or Bunny Money. 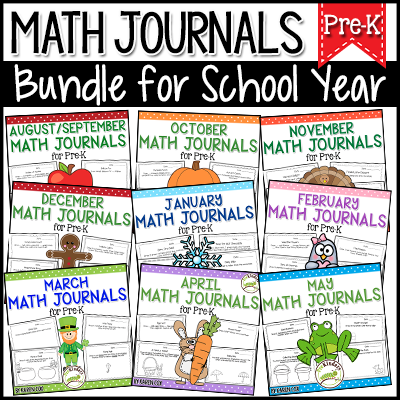 These activities integrate math, social studies, art, language arts, and science. I use real coins rather than plastic coins. Click for a list of Books about Money for Pre-K children. I keep one of each kind of coin in clear plastic punch cups for the children to use during these songs. To store them, I just stack the cups and put them away in a cabinet. 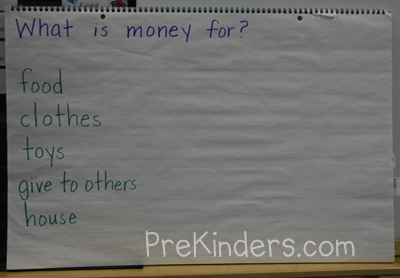 We have a class discussion about the purposes of money (food, toys, clothing, charity, etc.) and make a list on chart paper. 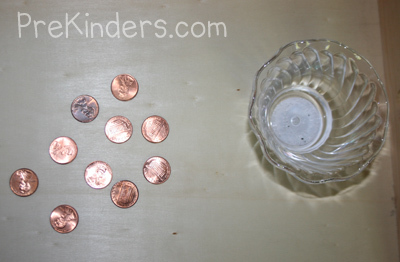 Children toss a cup of pennies onto a mat and count the heads and tails. Each child has a small jar filled with “candy” (small craft pom poms). I make money cards by hot-gluing real pennies to poster board pieces (or add coin stickers to index cards). Children pick a card and “purchase” the same amount of gumballs by taking them from the jar. Play until the jar is empty. 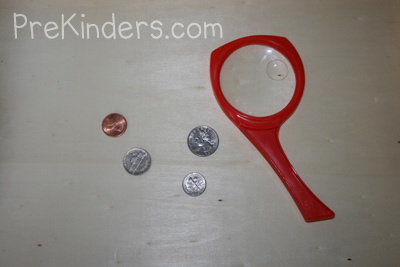 Children explore coins with magnifying glasses. 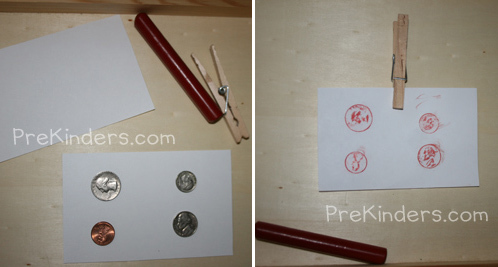 Children lay thin paper on top of coins hot-glued to poster board cards and clip it with clothespins to hold the paper it place. They use the flat side of a crayon to rub over the paper and make an impression of the coins. 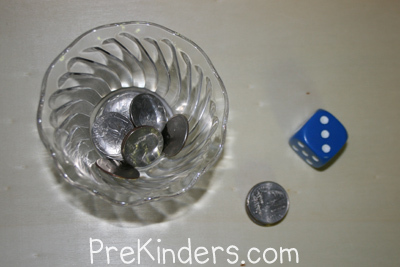 Children roll a die and stack that amount of quarters and continue until the stack falls. Children make patterns with coins. For example, heads, tails, heads, tails; or, penny, nickel, penny, nickel. 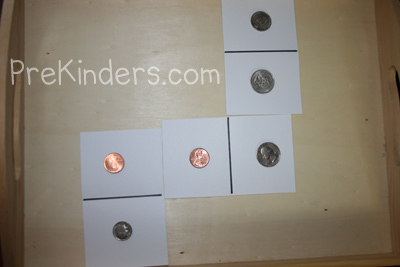 Make dominoes by cutting rectangular pieces of poster board and hot-gluing different coin combinations. Draw a dividing line in the middle. Children play dominoes in the usual way, matching the coins. Sort coins into a sorting tray. Place different types of beads into cups with price tags for each cup. Children “buy” the beads by counting out the correct amount of pennies for each bead. Have them string the beads onto a pipe cleaner or lace to make a bracelet. Print out the printable below and have children draw to create their own play money. The play money can be used in a dramatic play store. Play food from the housekeeping center is labeled with price tags. Sometimes these are labeled using only penny stickers and sometimes they are labeled with a numeral. Children use purses or wallets with coins inside to play store. Children dig to find coins that are buried in the sand table, and sort them into a sorting tray. During snack time, different types of snacks are put in separate boxes, labeled with a price. Children use pennies to “buy” their snack. We have large craft pom-poms for the scoops of ice cream, and bowls, spoons, and ice cream scoops. A price list shows how much the ice cream costs. Children use pennies to “buy” ice cream at the shop. Some children are customers and some are employees. Children make a name bracelet with letter beads. Children “buy” the letters to spell their name with pennies. Each bead costs one cent. They count the letters in their name, then count out the amount of pennies they will need. You can also use letter stickers to stick on paper instead of making a bracelet. We collect money for charity. 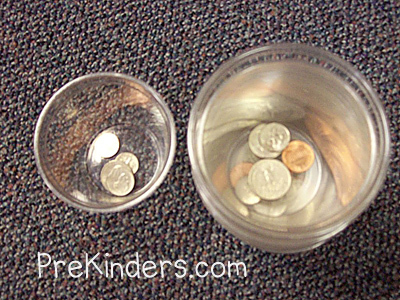 Children sort their coins into separate jars (one jar for each type of coin). “Coin County” is a good book for collecting money for a charity. 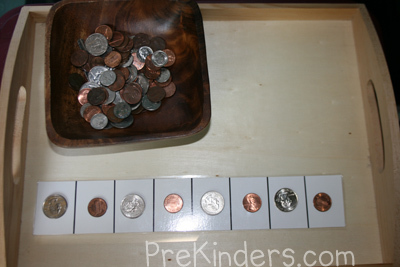 Children place their coins in the slots of the book, and when the book is full, the class will have collected $20. Throughout the year, some of the school clubs sell things like pens, candy, baked goods, etc. This is a good opportunity for the children use money themselves. They choose the item they want and I guide them in counting out the money by telling them how many coins to give. For example, “You need 3 dimes… then 5 pennies”. Thank you for compiling all of this information. This website is awesome for my Junior Kindergarten class of all boys. Do you have printable money pattern cards. I have been searching the past two days for interesting activities that explore money, specifically coins. This post has been the most useful by far! I can’t wait to try some of these out next week, thanks! You are so creative! These ideas are so fun and interactive, I know my preschool son will love the hands-on activities. Thank you for making learning interesting and sharing your wisdom!